Adds a resurrection skillbook to the table in the starting area of the ship you spawn in. It requires Hydrosophist level 5 to learn, takes 2 memory slots, costs 4 ap to cast, and has a cooldown of 6. Skillbook is also craftable using 1 restoration skillbook, 1 resurrect scroll, and 1 life essence. I have uploaded an additional file that modifies the treasure table for water skillbooks. I am keeping it separate from the main mod so as to allow it to be disabled in the event it causes conflicts with other modified tables in the future. The skillbook should now be available for purchase at the water trainer, late game skillbook vendors, and on Rezik in Fort Joy. When using it, be sure it loads after the spellbook mod in the load order. I was made aware of an issue in which hirelings were unable to be resurrected via this spell. I changed the target conditions and that should no longer be the case. I have also changed the crafting requirements from 1 blank water skillbook to 1 restoration skill book, which should be easy to find. The skillbook for this version is available next to your starting location in fort joy. 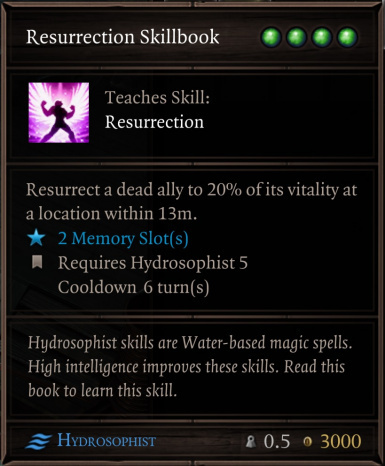 It is craftable by combining 2 ordinary (non glowing) hydrosophist spellbooks.